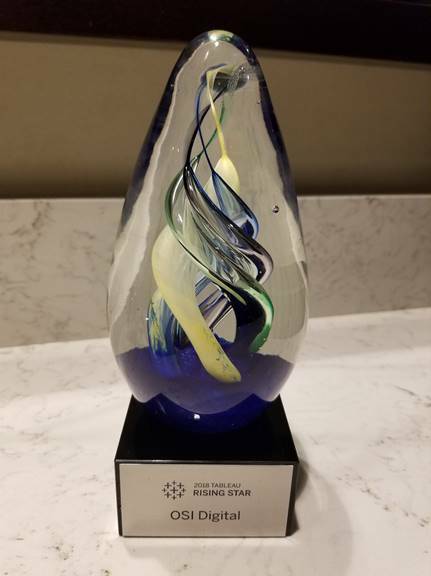 SEATTLE, WA: Jan. 31, 2019 – OSI Digital, a global provider of business and technology solutions, is proud to be named as ‘Rising Star’ Partner of the Year at Tableau’s 2018 Americas Partner Awards. Tableau honored its leading technology and channel partners at their Partner Executive Kick-Off in Seattle, Washington on January 29. Each year, Tableau’s partner awards recognize performance excellence and the significant achievements of its global partners. “We’re thrilled with this recognition as the OSI Digital team greatly values our relationship with Tableau and the data-driven outcomes we provide for our joint customers,” says Jeff Pierick, CTO, and Data Analytics Practice Leader at OSI Digital. OSI Digital provides a full spectrum of Data Analytics solutions including deep experience and expertise in the implementation and deployment of Tableau products. OSI’s data analytics capabilities include: data management, visual data analytics, data warehousing, data architecture, advanced analytics, embedded analytics and performance management. Learn more about OSI Digital’s customer successes with Tableau including: Careform and Wedgewood Pharmacy. OSI has developed strong partner alliances with the world’s leading technology providers. Learn more about OSI Digital’s global Partnerships.